Video and audio clips pertinent to the history of the reestablishment of Eretz Israel. Historical proofs of the right of the Jewish nation to the Land of Israel. Documents of historical importance concerning Eretz Israel. Speeches and quotes that reveal the depth and intensity of the struggle for Eretz Israel. 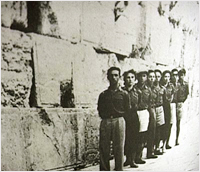 Memoirs of the days of the Irgun Zvai Leumi. Memoirs of the days of the LECHI. Shmuel Katz's personal memoirs and articles. A timeline from 1880 - 1948. Scriptural references to the Land. Categories of themes that influenced the reestablishment of Eretz Israel, and their continuous influence today. Essays and interviews from the eyewitness testimonies of the pre-state freedom fighters. Collections of articles on today's issues that reflect on the pre-state struggle for the nation in its Land. Listings of publications, web sites, and authors for further research into the history of the reestablishment of Eretz Israel. Images from the pre-state years and undergrounds from the Jabotinsky Museum Archives. This website is a research of the history of the Hebrew underground movements of Eretz Israel. From the beginnings of reestablishment in the 1880s until independence in 1948. Within its contents you will find the historical, legal, Biblical, governmental and militant foundations of the defense of the one and only Hebrew nation - in all of its Holy Land inheritance.